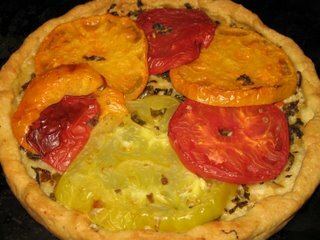 Last night I made some of my favorite tomato pizzas on the storebought "Viccolo" cornmeal pizza crusts. I've blogged about these before... they are just so good & I had to have it one more time, while there were still big fat heirloom tomatoes at the market and basil leaves on my basil plant. As is always the case, they were insanely delicious. I just put on a couple cloves of garlic (put through the press), a 1/2 teaspoon or so of good olive oil, a ton of minced fresh basil, and some big thick tomato slices (oh and a little sprinkling of salt)... cook it for about 25 minutes at 425... heaven! Also, tonight we had our next-door neighbors over for dinner & to look at some pictures from our trip. One of our neighbors doesn't eat dairy (no problem), but also prefers not to eat wheat or soy... so I wanted to come up with something that would be tasty and fit everyone's preferences. I am always so touched when people accomodate my vegan-ness... so I really like to make sure that my guests also feel welcomed! So, in the end I went with Indian food - easily vegan and easily wheat and soy-free! 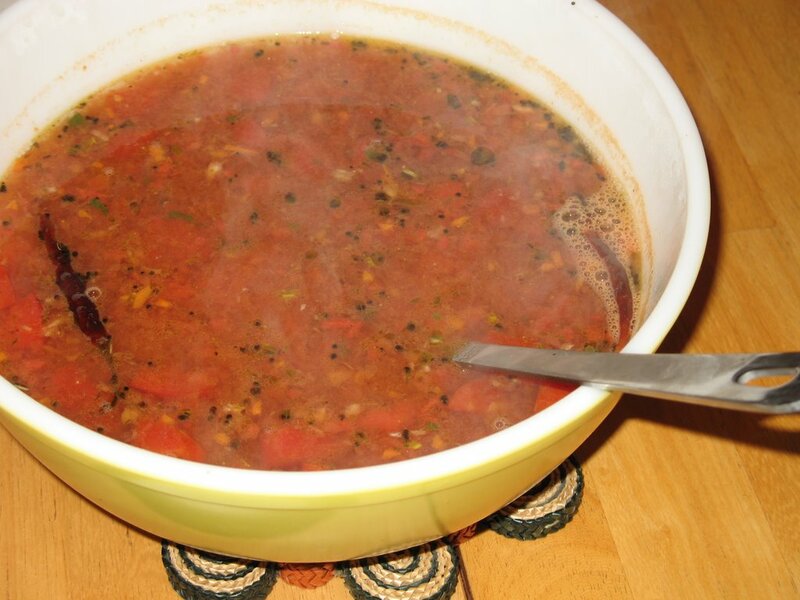 I made this Rasam Tomato Soup, which JenniferSchmoo at Vegan Lunch Box just blogged about! It was easy, spicy, and delish!!! When we were in South India about 3 years ago, one of the very best meals we had was some spicy tomato soup... This recipe was different, but still very good - and closer than anything else we've found. A new favorite for sure! For the main course, I made the Spicy Rice with Toasted Almonds from the VwaV book (very easy and very tasty), and a homemade concontion with cauliflower and chickpeas. For the Spicy Rice I decided to tone down the spicy-ness a bit, and also just oven-toasted the nuts instead of frying them. 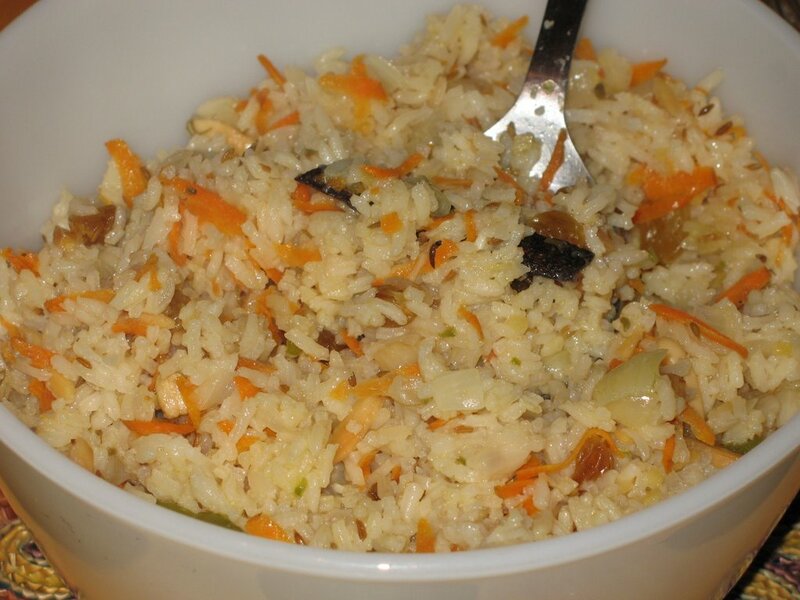 I loved the rice... a great recipe full of flavors & textures. 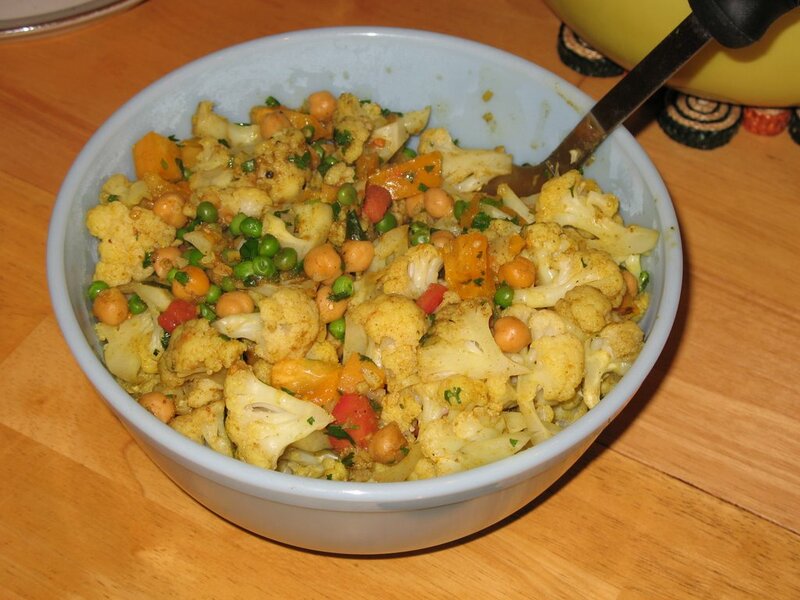 For the Veggie Curry, I cut up a whole head of cauliflower and steamed it for about 4 minutes. Then I sauteed a can of chickpeas (drained) with some cumin, coriander, turmeric, fennel seeds, cayenne, and salt for about 5 min. I added in the steamed cauliflower, and some frozen peas (and a touch of water), and cooked about 5 min more. Tossed in a big handful of cilantro and a couple of chopped up tomatoes... voila! It was a great meal! For dessert we had some coconut sorbet with toasted slivered almonds and chocolate sauce.... but that was eaten too quickly to photo-document. Sorry! gorgeous dinner party- your guests are so lucky! i just realized i haven't had indian food in so long- and i love it- why? i think i'll whip up something along these lines soon. thanks for the heads-up on the tomato soup recipe! it looks delish.